In many standard apartments bathroom is quite a small room, and in this limited space wide range of inevitable furniture and other utilitarian objects are to be placed. Moreover, liquids, sprays and powders for washing linen and cleaning bathroom as well as multiple hygienic and beauty products are to be stored in this room. To avoid clutter on countertops, these things can be put inside of bathroom cabinets. 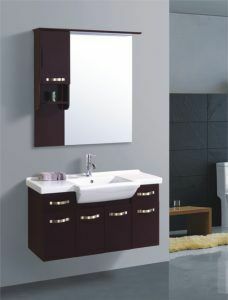 Bathroom mirror cabinet is very popular piece of furniture, combining storage function with mirror. Convenience for storage. 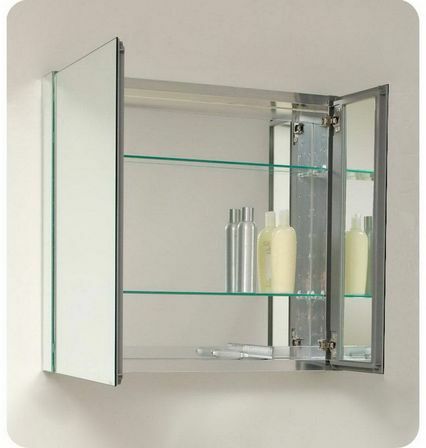 Bathroom medicine cabinet with mirror allows to place in order on its inner shelves all small necessities which can be found in any bathroom: shampoos, shower gels, cosmetics, washing powders and many others. Such cabinet can even accommodate water heater if needed. Multiple inner drawers, shelves and hooks altogether save great deal of useful bathroom space. Versatility. 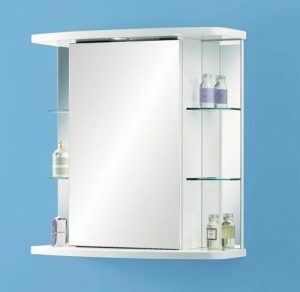 Bathroom cabinet mirror can combine functions of mirror shelf, medicine cabinet, chest of drawers, closet and some others. It is very economical in use. 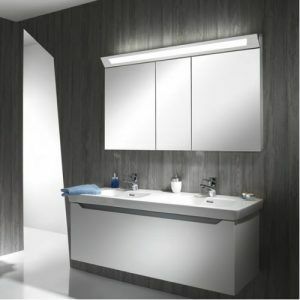 If LED strip or point lights used in mirrored bathroom cabinet, then, due to reflection, bathroom gets an additional lighting which can even spare other light sources and, thus, will reduce electricity costs. Functionality. Wide range of cabinet doors’ configuration allows choosing what’s right and convenient for any particular bathroom. Bathroom mirrored cabinet easily fits in any style. Mirror surface requires daily care. Fingerprints, water drops and various stains are dramatically visible on mirrored doors of cabinet. In order to look neat, bathroom medicine cabinets with mirrors need to be cleaned and wiped much more frequently than regular ones. Size. If it is too big for particular room, it eliminates all space saving qualities of this furniture item. Mirror surface is fragile by its nature. Being placed on such frequently used furniture part as mirrored cabinet’s door, it requires gentle and caring use. Cost. 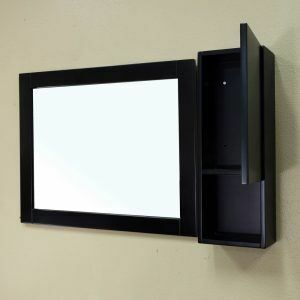 High quality bathroom mirror cabinets might be quite pricy. Mirrored cabinets are made from different materials as wooden sandwich panels, plastic, glass, fax stone and many others. Materials, used in bathrooms, are required to be absolutely safe as well as waterproof. Keep in mind that some materials, as wooden sandwich panels for example, tend to absorb aromas, which makes them less convenient for keeping multiple cleaning, hygienic and cosmetic products together. Plastic cabinets are widely used as well. Though, most of them are not really durable. Glass shows the best quality. It is almost as solid as stone while it does not weight as much. Mirror surface is supposed to be made especially for bathrooms. 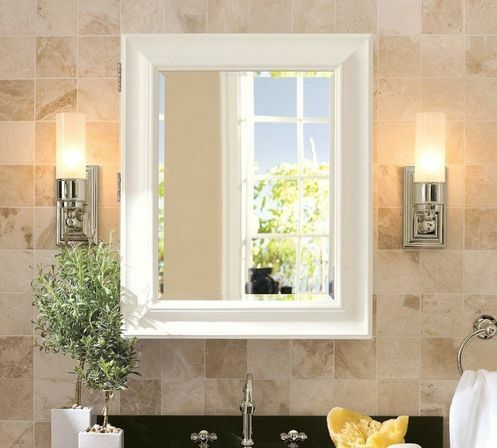 Bathroom mirrors are meant to resist hot temperatures, humidity and water drops. 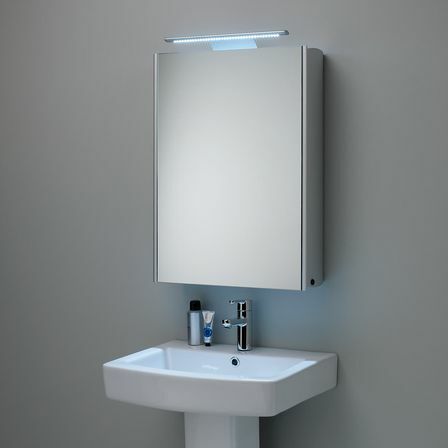 Bathroom cabinet mirror can additionally feature special heating pads which prevent mirror surface from fogging when hot water is on. 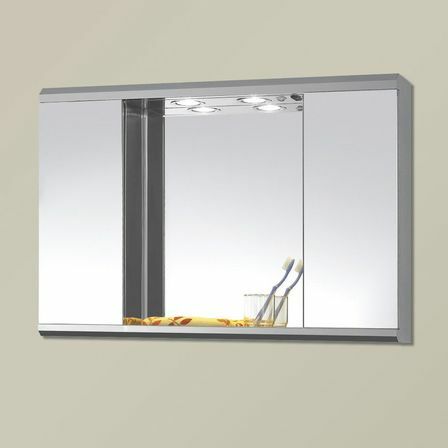 With this modern feature person can enjoy clear reflection straight after taking hot shower, which is convenient and time-saving for busy mornings, for instance. 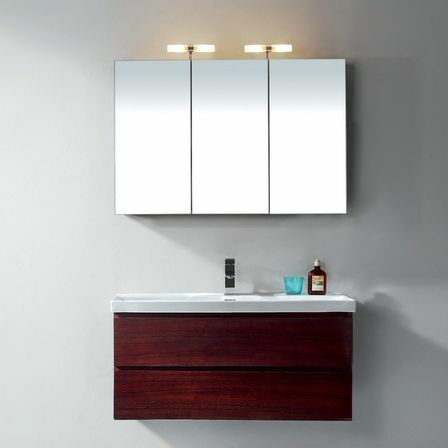 Being such a popular piece of furniture, bathroom mirror cabinets come in different variations so that everyone can pick a cabinet, meeting criteria of particular needs, personal taste and budget. There are some basic budget models, providing minimum needed comfort as well as some exquisite designed luxurious models, made of premium quality materials and featuring all modern facilities. Mirrored cabinets can be grouped in accordance with different criteria. 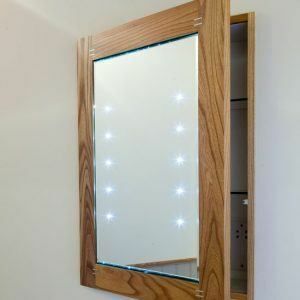 Bathroom mirror cabinets with lights. Such cabinet is featured with lighting fixtures, electric socket and tumbler switch. Lighting fixtures can be either mounted over cabinet or built inside. 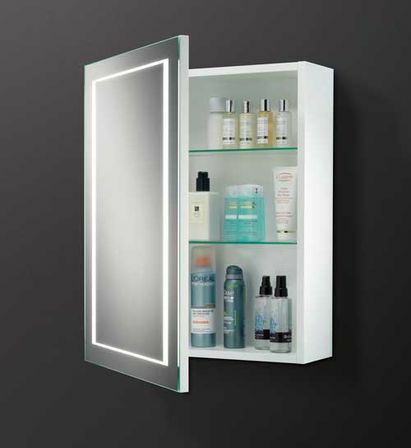 The optimal modern lighting solution is LED, built in mirrored doors of cabinet. This type of lighting provides practical, esthetical and economical advantages. 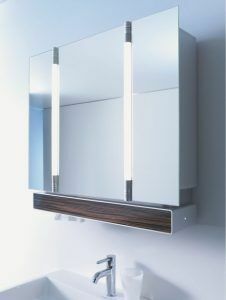 Quite big mirror surface of cabinet’s doors, reflecting light, creates flattering visual effect. Room seems to be more spacious and well-lit, which is very beneficial for many standard city apartment bathrooms. 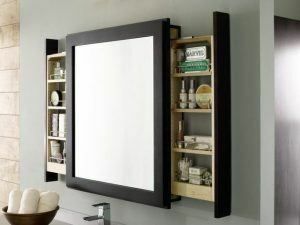 Hanging bathroom mirrored cabinet. This type of furniture can be made for hanging on the wall or in the corner. 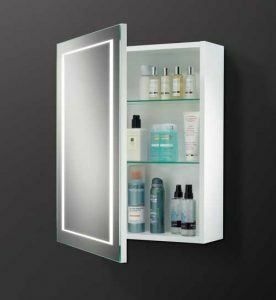 Hanging bathroom mirror cabinet usually has such standard dimensions: 57-90 centimeters height, approximately 50 centimeters width and maximum depth of 25 centimeters. Door can either feature built-in mirror or can be wholly made out of mirror surface. 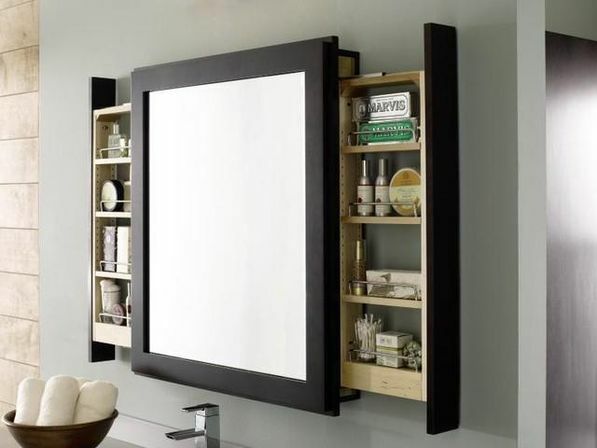 Inner space of mirrored bathroom cabinet is organized with shelves. There also can be some additional external shelves on each side of construction or situated asymmetrically. 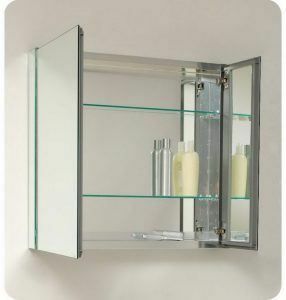 Corner hanging bathroom mirror cabinet is meant to be secured in the corner of two adjacent walls. This model is perfect for tiny bathrooms – not only it takes less space than regular one while providing the same room for storing bathroom essentials, it also optically “sets walls apart” by reflecting light in the corner. Floor mirror cabinet is big enough to accommodate all possible bathroom accessories, including dirty linen bin. 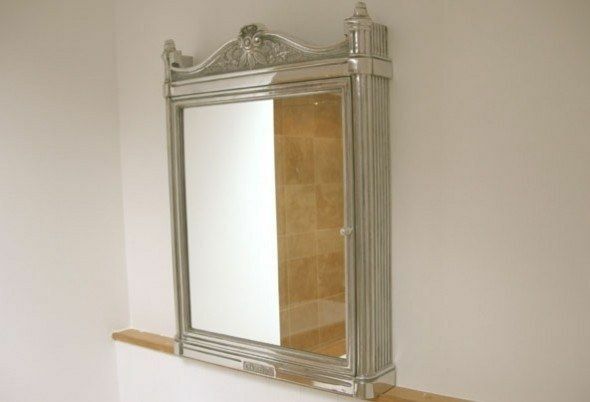 Being tall, its door forms a large mirror, reflecting person at full height which is very handy for grooming purposes. 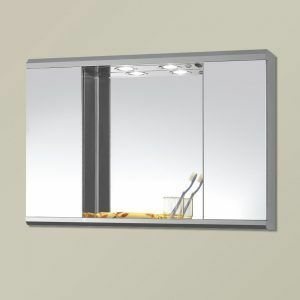 Mirror can be as well equipped with LED lights and anti-fog heating pads if needed. Large mirror looks especially flattering in bathroom interior, providing optical effect of wider and larger room. On the other hand, floor cabinet mirror cannot be used as vanity mirror over sink so it can be used as additional mirror but not as the only bathroom mirror. Long narrow floor mirror cabinet. Most pros and cons of this configuration are identical to previous one. Also this particular model requires very little space so it is a good solution for small standard city bathrooms. 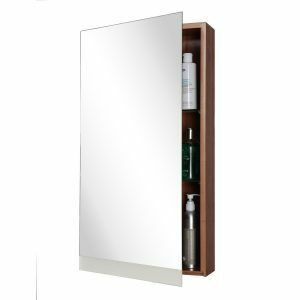 Bathroom mirror medicine cabinet is useful piece of furniture, which conveniently organizes on its shelves detergents, cosmetics, toiletries, medicines and other items if needed. Along with practical features of mirrored cabinet, its esthetic role in forming whole bathroom interior is very important. Most of models in sale are plain white matt cabinets of simple shapes. This is not a coincidence. Initially idea of combining bathroom cabinet with a mirror was meant to solve a problem of lacking space in tiny simple bathrooms. It is still the most budget combo of bathroom furniture. White is a basic color, easily matching with sink and tub, it also looks appropriate in tiny modest interiors which would not tolerate bold-colored extravagant furniture. Most of budget bathroom furniture lines come in white color so it is easy to furnish bathroom even if items are bought separately. Interesting lighting solutions and occasional color accents will prevent room from looking boring or – even worse – hospital-like. It can be as simple as ultramarine glasses on the sink just below the cabinet. Or it can be several waterproof decorative stickers, put on the cabinet and other furniture in several places to brighten up bathroom’s mood – marine patterns as starfish and seashells would work fine. If bathroom is relatively small and is in budget style but homeowners don’t want mirror cabinet to be white, there’s a sure way to opt for pastel colors. There are some budget bathroom furniture lines in such colors as mint green or dusty rose. 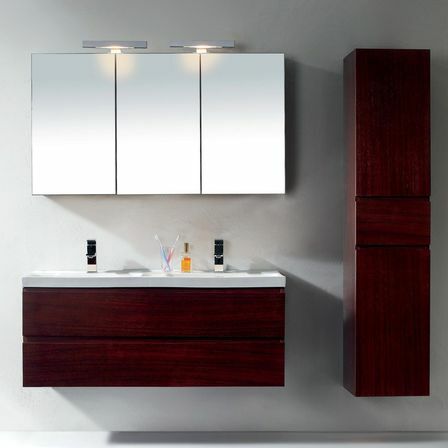 In modern and high-tech interiors, provided that there is enough space, bold-colored mirror cabinet can look right. Red and blue colors, combined with white are classics. Black furniture can look very edgy yet elegant. When choosing such colors, it is necessary to keep other furniture in the same coloristic scheme, and actually from the same furniture line as possible. Other moment to be considered is that making furniture such a statement, it is crucial to keep walls and floor very neutral; otherwise you get clownish ill-tasted effect. 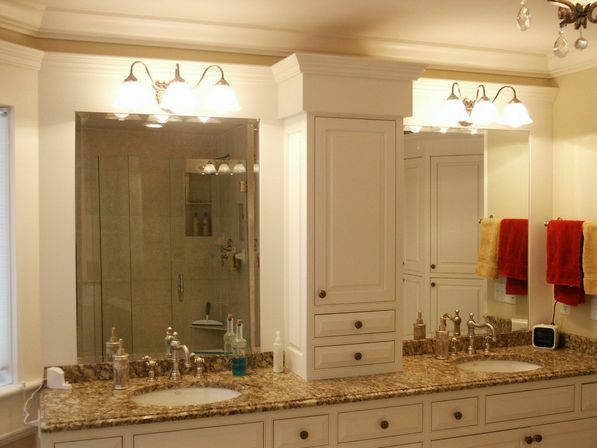 If there are two sinks in a bathroom, then two identical mirror cabinets should be put above the sinks or vanities. 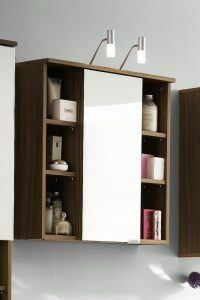 Having such double for-him and for-her bathroom mirrored cabinets allows each person to keep personal belongings and toiletries in more convenient way. Mirrored cabinet can be found even in rustic bathroom interiors. Rough wooden texture or its imitation is a must for creating needed mood. 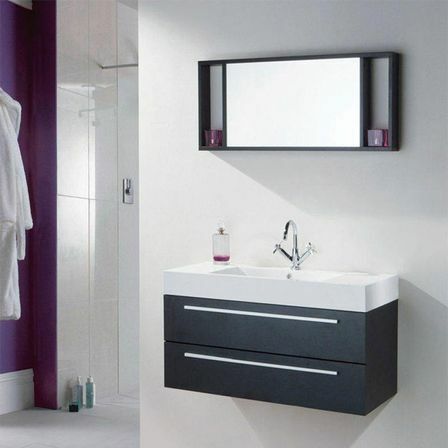 Including mirror cabinet bathroom interior looks modern and fresh. But to give adequate reflection and to play decorative role in interior, all mirror surfaces require careful handling. It’s highly recommended to wipe mirrored doors of cabinet daily to prevent resistant spots appear on mirror surface. 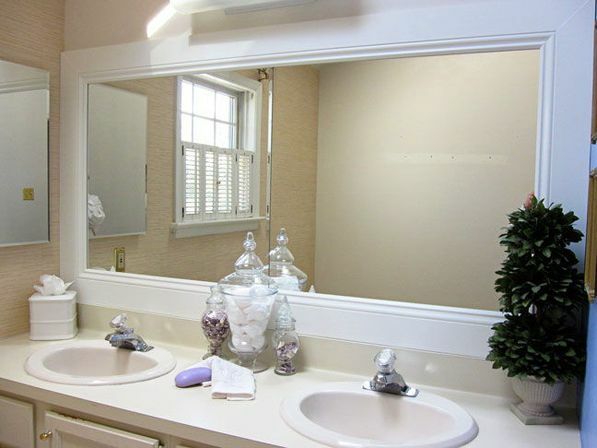 Here are some tips on appropriate care of bathroom cabinet mirrors. It is good to use soapy liquid with several drops of ammonia for washing cabinet’s mirror surfaces. Use of abrasive detergents leads to damaging of mirror surface and causes scratches. Hard rough sponges, cloths and cleansing napkins do exactly the same. Soft detergents in gel form are ideal for use. 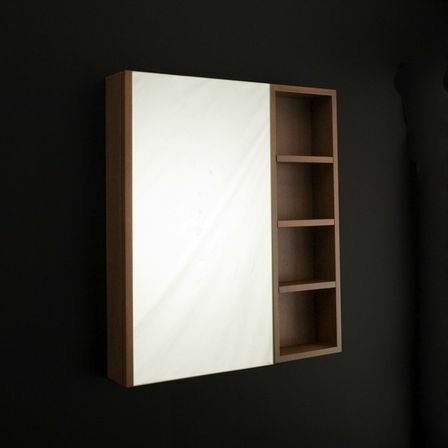 To prevent mirror surfaces from getting dim, it is recommended to smother it with oil. After doing so, mirror should be washed and gently wiped till sparkling. Mirrors tend to fog after hot shower or bath is taken. There’s no need to wipe this condensate away, it is enough just to air bathroom. There are many special detergents designed for mirror surfaces so it is not difficult to pick one.